Ready for a crazy easy and fast recipe?! Because here it is! Okay, okay you're probably SO tired me posting recipes that involve stuffing something. Since this is like, four in the past two weeks? More? I'm too afraid to count. However, it's not my fault. Not totally. It's just that I've realized how amazingly easy - and quick! - it is to a make a meal that involves stuffing all the ingredients together. This meal comes together in a flash, and is stuffed with great-for-you foods! Veggies, whole grains and lean meat. It's also super filling, thanks to all those great ingredients. I love a tasty dish that leaves you feeling good because you fed your body what it needs. And this was super tasty. Not only that, just one each was enough for John and I to feel full and satisfied. No sides needed. Perfect lazy meal. *Cut off top of red pepper. Try to cut as little as possible. Cut out pepper's ribs and pull out seeds. Trim any ribs after you've pulled out the seeds/center. *Combine brown rice, corn, peas and turkey meat sauce in a bowl. Mix well. 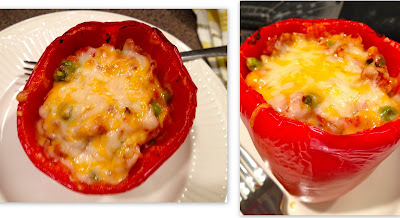 Spoon mixture into each bell pepper. *Place peppers in individual ramekins or in a casserole dish. Bake for 25-30 minutes. *Remove peppers and top with cheese. Bake for an additional 10-15 minutes, until cheese is melted and golden. OMG! This looks delicious! I must try! Thanks for the fab recipes!